Vibrant, Show-Stopping Trade Show Graphics – Produced In-House! The in-house graphic production team of E&E Exhibit Solutions can help you create the perfect graphics to accompany your new, existing or rental trade show display. Our graphics team has expertise in large-format graphic design, color matching, printing, finishing and installation. What Kinds of Trade Show Graphics Can Our Team Create for you? Our on-site production facility is staffed by trade show graphics professionals with training in industry standard design software programs and large-format output. Our graphic technicians specialize in outfitting our trade show displays with graphics, but they can also create and fit trade show exhibit graphics to almost any display brand. In addition, E&E Exhibit Solutions is a Chromatix Trained Digital Printer, meaning we have systems in place to match colors quickly and consistently, so your trade show displays and graphics complement your marketing collateral and other branding materials. Our growing arsenal of production equipment features a number of the latest large format printers, capable of printing on a variety of papers, vinyl and substrates, such as bonded metal, unfinished wood, low-pile carpet and synthetic flooring. We’ve honed our production process to maximize output for speed, color accuracy and quality. This process also consists of professional finishing services including mounting and laminating, custom die cutting, grommets, hook and loop tape or other special finishing method. Large-format trade show graphic design takes some know-how. 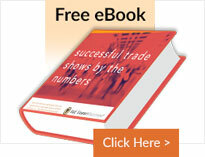 What works for small brochures might not work well for grand trade show exhibit graphics. At E&E Exhibit Solutions, our experienced graphic designers know how to translate your design into effective large-format trade show graphics, making the most of your marketing messages and keeping in line with your company’s brand and image. E&E Exhibit Solutions also offers a wide range of customized booth rentals (in approved states).